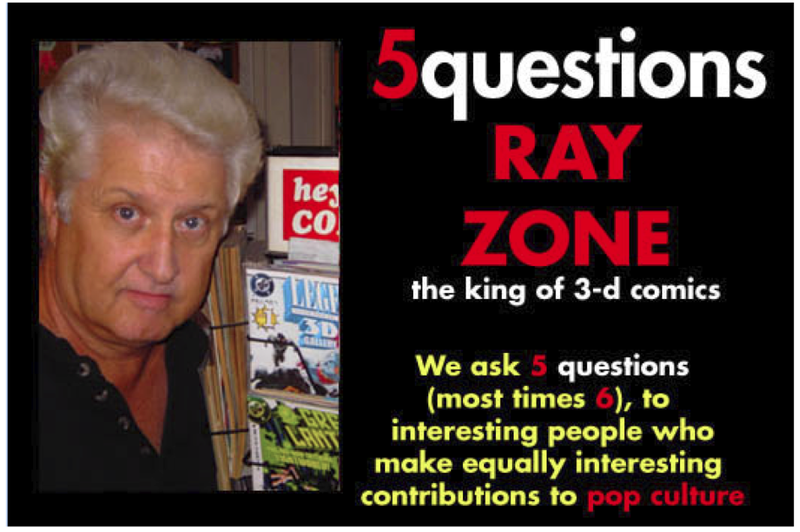 Having just become aware of Ray Zone’s passing, I thought it might be appropriate to rerun an interview that I conducted with him back in the spring of 2008 on the old site, Forces of Good. FOG! : Tell me about your latest projects. Ray Zone: My latest book, Stereoscopic Cinema and the Origins of 3-D Film; 1838 – 1952 is just out from University Press of Kentucky. March 2008 issue of Nickelodeon Magazine was a special 3D issue with 3D comics and a special Spongebob 3D mini-comic for which I converted the “flat” art to 3D. Also, The Black Dossier, League of Extraordinary Gentlemen (Wildstorm/DC) graphic novel by Alan Moore and Kevin O’Neill has last 17 pages in color 3D which I produced. And recently I have been working as 3D Supervisor on The Dark Country, a stereoscopic 3D feature film by Thomas Jane, who is also Raw Studios publisher of Bad Planet comic book, third issue of which was published last year with 14 pages of 3D I produced. Joe Kubert and Norman Maurer who invented 3D comics in 1953. I don’t really think it’s “awful” but have to admit that the FX TV series Dirt, with the first season recently issued as DVD boxed set is a guilty pleasure for me. The Absolute Edition of The Black Dossier graphic novel has 3D endpapers for which I converted Kevin O’Neill art to 3D. If you were to have dinner with 5 fictional characters, who are they and what would you serve? How do you think computers have changed when designing 3D for the printed medium and do you think it’s a positive or negative thing? Computers have made it much easier to create 3D for printed media as well as photography and motion pictures. This is a wonderful thing because it has led to a renaissance of 3D art and movies. Win 'Kill Zone 2' on Blu-ray! Win 'The Monkey King 2' on Blu-ray!